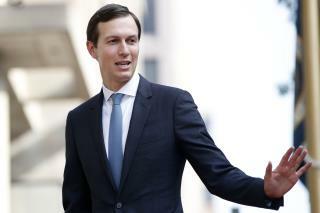 (Newser) – House Democrats vowed to step up their investigation of White House security clearances amid reports that President Trump demanded a top-secret security clearance for son-in-law Jared Kushner. Sources tell the New York Times that Trump ordered former chief of staff John Kelly to grant Kushner the clearance last year despite objections from intelligence officials, as well as then-top White House lawyer Donald McGahn. The sources say concerns about Kushner included his foreign business dealings. Insiders tell the Washington Post that after Kushner and wife Ivanka Trump complained about his long-delayed clearance, Trump told Kelly to "fix the problem." This reminds me of Nixon ordering that Henry Kissinger be given a security clearance. There are American Terrorist blacklist Trump's Jr., Jared Kushner, John Bolton, Ted Cruz, Marco Rubio, Israel are on European diplomatic terrorist blacklist. Dems threaten to subpoena White House: Wow, now there's some news. They threaten everyday. Kushner, working for peace in the entire world, needs his clearance. If there is a shortage of clearance cards let's go back into the Obama admin and completely wipe out any errant clearances given to the clowns and then there will be more than enough to go around. Brennan, deservedly lost his, what other degenerates still have clearances? What other sell outs?